You know how the baddies won’t just kill the good guy even when there’s a golden opportunity to do just that? Well, this has happened enough times in Daredevil history to warrant its own series of posts, starting right here. Be warned that this ride through the history of the contrived may cause headaches and nausea and may not be suitable for our more sensitive readers. Daredevil has been knocked unconscious. 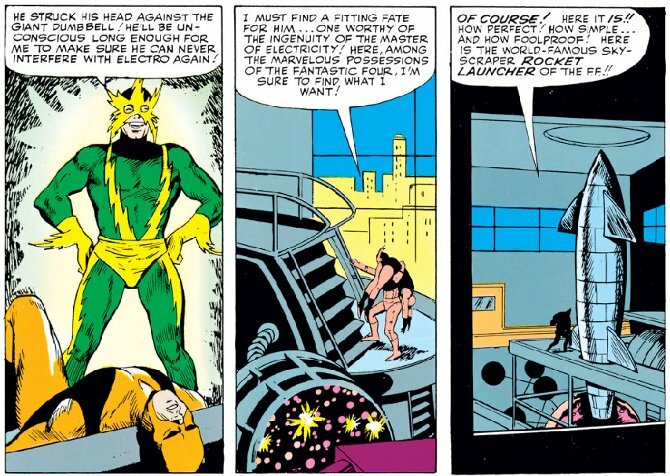 In Electro’s own words: “He struck his head against the giant dumbbell! He’ll be unconscious long enough for me to make sure he can never interfere with Electro again!” Electro obviously has the means and the motivation. So what’s keeping him? Electro is clearly a megalomaniac with illusions of grandeur. He doesn’t want an easy kill, he wants to execute people in stolen space craft, wasting hundreds of gallons of rocket fuel. He wants everyone to know he can stage a death like no one else. In his own words: “I must find a fitting fate for him… One worthy of the ingenuity of the master of electricity! Here, among the marvelous possessions of the Fantastic Four, I’m sure to find what I want! Of course! Here it is!! How perfect! How simple… And how foolproof! Here is the world-famous skyscraper rocket launcer of the FF! !” How simple? Geez, if you wanted a theme-appropriate death that would have the whole town talking, how about just letting him take a swim with a hairdryer? As we all know, letting him live was a big mistake, though apparently not big enough to keep Electro from making the very same mistake again in a later issue. But that’s for another day. Villains are all about the set-up, the wait, the poor exucution and the comeuppance. It's such a standard trope that I wouldn't be surprised to see such contrivances meet a resurgence in about ten years, for some nostalgic-memories "they don't write them like the old ones" moments. It also shows that the villains aren't complete sociopaths, but more arrogant egotists, more excited by the interplay than by the coup de grace. That, and the sexual subtext of them not wanting to kill their greatest love that they can never acknowledge, haha, if you're inclined to thinking that way. Good article, can't wait to read the next part, 'cos there's plenty of them to choose from in DD history. My question would be, why hasn't DD killed Bullseye yet? Two girls dead, and one other threatened. Murodck needs to man up! Oh, Matt. Even Electro loves you. This was cool. I've never read older DD, so I'm looking forward to the next installment. Thanks. There is something nostalgic about this plot device that makes me feel like a kid again. Something that reminds me of the old Batman series from the 60s. Using this device to leave us hanging for the next installment is very old and weird tradition in comics. I wish I could say they only used it back in the day, but I can think of much more recent moments in DD where they’ve don’t this…but I think Christine is poised for that attack on that one. As for killing Bullseye…Nay. Demoralize and humiliate Bullseye, yes. Kill Bullseye, never. Unless it’s accidental, or a very, very, very last resort that just ain’t DD. I’m still mad over him leaving that dude on the train tracks in the movie. …and I'm going to read my comments more carefully so I don't sound like a doof. Sorry all.